This recipe does not include the crust. We recommend buying a premade crust from the store and saving your self a world of trouble. Add sugar, syrup, salt, oleo and vanilla to eggs beaten light. 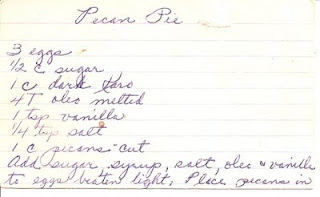 Place pecans in bottom of unbaked pie shell, pour mixture over nuts. Bake 350 degrees for 60 mins.